Designed to perfectly match any type of recreational vehicle in terms of both its outer shape and its interior furnishing details, the materials chosen to create their products go through strict quality checks and tests to guarantee that every product will retain its appearance over the course of a long working life. The TELECO range of satellite products includes Dishes of all different styles and types from rooftop wing and folding units to stand-alone dishes that can be deployed in seconds. But a dish is no good without a Receiver and TELECO’s range are the best, including their amazing mini Terrestrial Receivers capable of receiving hundreds of channels that can be recorded onto a simple USB drive. Alongside receivers, TELECO have a range of HD TV’s that can be run off 12v and many have built in DVD Players too, perfect for saving space where space is tight. Also available from TELECO are their range of brilliant Solar Panels like their TPS 130W - Mono-Crystalline Solar Panel with a Rated Power of 130W, rated voltage of 18.36V and rated Current of 7.1Amps. 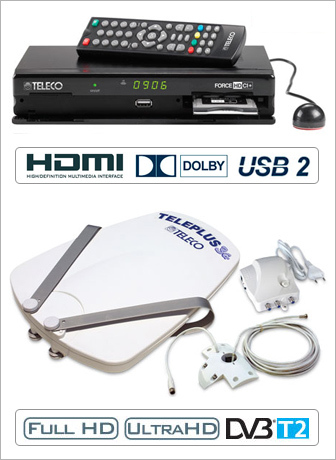 There are a huge number of products available from TELECO, please Contact Us for information.